WASHINGTON — The world won’t end if a dysfunctional Washington can’t find a way to pass a funding bill before this weekend. That’s the truth about a government “shutdown”: The government doesn’t shut down. Hundreds of thousands of federal workers will be forced off the job, and some services will go dark. It’s a crummy way to run a government, sure, but Social Security checks will still go out. Troops will remain at their posts. Doctors and hospitals will get their Medicare and Medicaid reimbursements. In fact, virtually every essential government agency, like the FBI, the Border Patrol and the Coast Guard, will remain open. Transportation Security Administration officers will continue to man airport checkpoints. WHO WORKS AND WHO DOESN’T? In the case of a shutdown, fewer than half of the 2 million civilian federal workers subject to it would be forced off the job if the Trump administration follows the rules followed by previous Presidents Ronald Reagan, George H.W. Bush, Bill Clinton and Barack Obama. That’s not counting about 500,000 Postal Service employees or 1.3 million uniformed military personnel who would be exempt. The rules for who works and who doesn’t date back to the early 1980s and haven’t been significantly modified since. The Trump administration is relying mostly on guidance left over from Obama. The air traffic control system, food inspection, Medicare, veterans’ health care and many other essential government programs would run as usual. The air traffic control system, food inspection, Medicare, veterans’ health care and many other essential government programs would run as usual. The Social Security Administration would not only send out benefits but would continue to take applications — though replacements for lost Social Security cards would have to wait. The Postal Service, which is self-funded, would keep delivering the mail. The Federal Emergency Management Agency could continue to respond to last year’s spate of disaster. 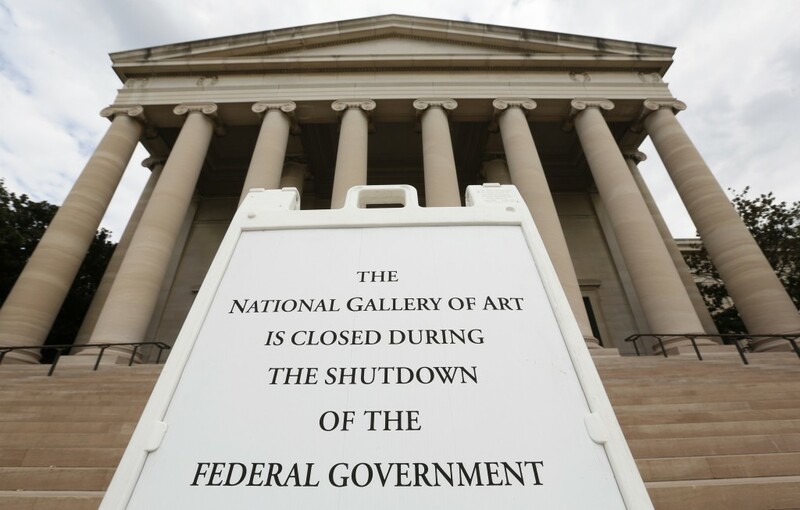 The last shutdown was a 16-day partial shuttering of the government in 2013. The last one was a 16-day partial shuttering of the government in 2013, which came as tea party conservatives, cheered on by outside groups like Heritage Action, demanded that language to block implementation of Obama’s health care law be added to a must-do funding bill. WHAT WERE THE POLITICAL REPERCUSSIONS? In a 1995-96 political battle, Clinton bested Newt Gingrich and his band of budget-slashing conservatives, who were determined to use a shutdown to force Clinton to sign onto a balanced budget agreement. Republicans were saddled with the blame, but most Americans suffered relatively minor inconveniences like closed parks and delays in processing passport applications. The fight bolstered Clinton’s popularity and he sailed to re-election that November. Now, as House speaker himself, Ryan is struggling to head off a shutdown on his watch. “I think cool heads, hopefully, will prevail on this thing,” Ryan said Wednesday. HOW MANY WORKERS WERE AFFECTED IN PAST SHUTDOWNS? In 1995, 571,000 Defense Department civilian employees, some 69 percent, remained at their post, while 258,000 other Pentagon workers were furloughed. Eighty-five percent of Veterans Administration employees went to work, as did 70 percent of Transportation Department workers. The latest estimates from the Justice Department are that 83 percent of its employees, some 95,000 people, would be deemed essential and stay on the job. The 2013 shutdown resulted in the furlough of 850,000 employees, which cost the government 6.6 million days of work and more than $2.5 billion in lost productivity and pay and benefits for employees. 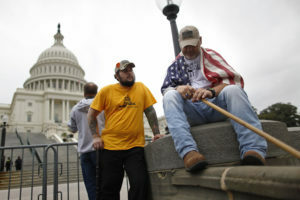 Left: U.S. Army veterans Peter Marshall Bland (C) and James Taylor (R) of Fort Hood, Texas, end a day of protest during the government shutdown in 2013. File photo by Reuters.